Thoughtfully written tale that teaches children and adults the significance of God's plan in their life. God always has a plan and a purpose for everything. He does things in His own unique way and in His own time. 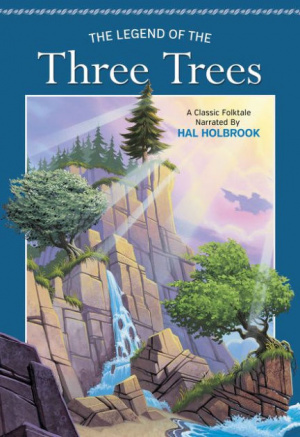 The Legend of the Three Trees is a timeless retelling of the classic folktale of three distinct trees, each with its own hopes, dreams, and aspirations. Each tree dreamed of becoming great - perhaps a majestic treasure chest, or a magnificent sailing ship, or maybe the tallest tree in the forest. But their dreams didn't seem to come true. Disappointed and dejected, the trees despair until they each interact with Jesus Christ - in His birth, ministry, and ultimate sacrifice. In these experiences they learn that God has a special purpose for each of them. Thoughtfully written and beautifully animated, The Legend of the Three Trees teaches children and adults alike the significance of their role in God's plan for the world. The Legend of the Three Trees DVD by Thomas Nelson Publishers was published by Thomas Nelson in March 2014 and is our 2802nd best seller. The ISBN for The Legend of the Three Trees DVD is 9781400323654. The kids really enjoyed watching this dvd. It was really simple and easy to follow, yet really engaging at the same time. Beautiful and brilliant with some lovely songs. I don’t think it will be forgotten in a hurry. Got a question? No problem! Just click here to ask us about The Legend of the Three Trees DVD.